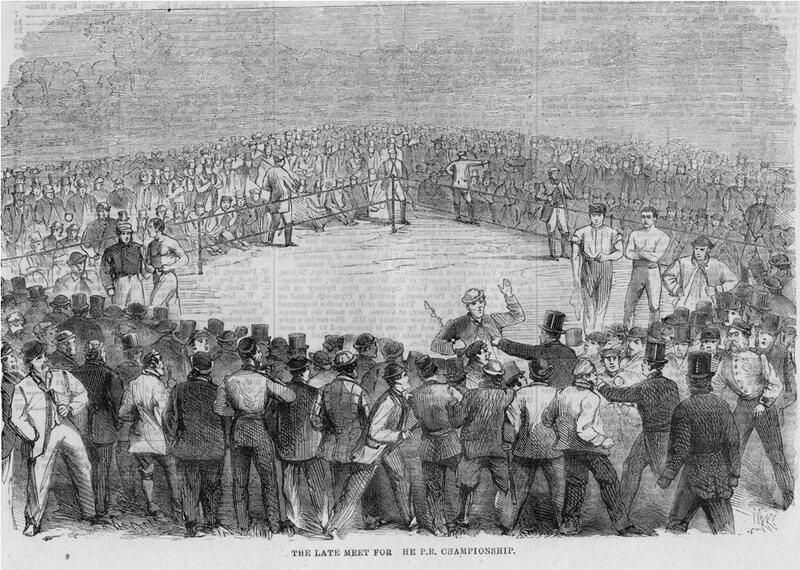 Contemporary drawing of the fight in the Illustrated Sporting News of 2 June 1866, probably showing one of the attempts of the police to intervene. On 3 December 1860 the first passenger trains ran on the new line between Bickley and Rochester built by the London, Chatham and Dover railway. On leaving Swanley Junction the train called at Farningham Road, Meopham and Sole Street - something missing surely? Where was Longfield, now by far the busiest station of the four? Well in 1860 it wasn't there! Longfield Station, or Fawkham as it was called until 1961, did not open until June 1872. But it was not the first time trains called here. On 24 May 1866 a special train called here to host the boxing championship of England for the title between holder Jem Mace and Joe Goss. “Gypsy” Jem Mace (1831-1910) was born in Norfolk (in spite of his nickname he said he was not of Romani ancestry). He was the holder of the belt following a forfeited match in 1865. Joe Goss (1837-85) was younger and had previously lost to Mace in a 19 round match in 1863. Their backers had put up a £400 prize for the winner (a pound then is worth about £75 today). Bare knuckle prize fighting was illegal, fighters were charged under a variety of ways such as assault or a breach of the peace. Their staging became even more difficult after the Accessories and Abettors Act of 1861 made it illegal to assist. Thus organisers and even a railway company who conveyed spectators could be charged under this Act. Secrecy was therefore necessary. Tickets were available from two pubs - The Mitre in Upper St Martins Lane, and the Northampton Arms in Northampton Street. It was not until the night before they were told they needed to get to Ludgate Hill Station at 5am the next day. "At the appointed time" wrote the Birmingham Post, "Traps and cabs of all descriptions were seen wending their way towards Ludgate Hill Station.... There, too, were stationed a strong posse of the company's officials, to prevent those having 'no briefs' from gaining access." No doubt mindful of the law, the railway officials present professed no knowledge of why the train had been booked to the amusement of many, but a large crowd had gathered hoping to see Mace and Goss. Train tickets were 2 guineas (£2.10) for first class and £1 10s (£1.50) for third class. The 15 carriage train left at 5.35am. At Farningham Road they stopped to check tickets before proceeding to Longfield, arriving at 6.30am. All praised the arrangements for the journey, the Express reported "all were full of joyous anticipation, from the 'swell' who looked anxiously after the stowage of his well stored picnic basket and hamper of champagne, to the vulgar red-eyed, puffy faced tavern keeper who passed from carriage to carriage offering in a hoarse whisper to 'lay 6 to 4 on Mace'." On arrival at Longfield there was a cry of "All Out", and the passengers found they had to scramble down a steep bank into a meadow, one man fell down head over heels and injured himself. Being north Kent, they rejected the first site as too flinty, but settled on one "enclosed almost by overhanging trees" about 100 yards from the railway line and 200 yards from Longfield Parish Church, apparently without the consent of the landowner. It was said that ‘ruffianly harsh voiced scoundrels’ patted the turf with as much tender consideration as housewives buying a new dress. Bancks says an earthern platform was built, but the Leeds Mercury said the passengers alighted onto the rails. It is difficult to pinpoint the location from contemporary accounts, but they suggest a place bordering the shaw that then marked the boundary between Hartley and Longfield, about where the new housing estate The Chase is now. Spectators who wanted to sit at the front had to pay an extra 5 shillings (25p), and seats were on hire for half a guinea. In all the crowd was about five deep and newspaper estimates varied between 300 and 600 strong. The Sheffield Independent described the fight: "It was within a few minutes of 7am when what is irony to call 'the fight' commenced; and from that time until ten minutes past eight, Mace and Goss danced about, squared, feinted, countered and shuffled without fighting a round, almost without giving a blow. The people about... were first remonstrative, and finally furious... It was all fruitless, however, and ... the two men having tired out the patience of their fierce friends and backers, shook hands, Goss without a scratch, Mace with a trifling abrasion of the nose and right cheek... Of course under these circumstances all bets are void, and neither man carried off either the champion's belt or his opponent's stakes." A few police tried to stop the fight but were prevented by the large crowd. However a second bout was in progress "when the reinforced police reappeared and straightway made for the ring. They drew their truncheons, and sought to force an entrance. This attack was received by the spectators with resistance, several of whom took up the camp-stools, and made use of them as weapons of defence. The utmost confustion ensued, in the course of which two of the police got their heads severely cut. No arrests were made, but the ropes and stakes were taken possession of by the local authorities." The Spectators caught a train home and arrived at Blackfriars at midday. That day the Rector of Longfield wrote to the Times to protest at the involvement of the railway company and its “savage freight”. The two men held a rematch on 7 August 1866 at Purfleet, which Mace won in 21 rounds. But this was the twilight of prize ring fighting, as it was replaced by the gloved boxing under the Queensbury Rules introduced the following year. 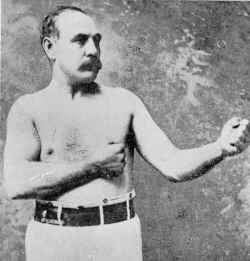 Jem Mace went to America, and in 1870 he defeated Tom Allen at Kenner Louisiana to take the world heavyweight crown, a title he held until defeat the following year to "Gentleman" Jose Alonso. His last bout was in 1909 when he was 78. Joe Goss also had a successful career in America. Hartley has more links with boxing, for Dave Charnley (1935-2012), the "Dartford Destroyer" lived in Manor Drive for about 20 years. He was a famous "southpaw" boxer who held the British, Commonwealth and European Lightweight crowns.